Anyone know name of this pattern? Thread: Anyone know name of this pattern? I have 2 young girls who come over weekly to learn to quilt. One of them found this picture and would like to try this as her next project. I would like to find the pattern for her if I could so that she can actually learn to go by the patterns and learn as she works. Does anyone know the name and where I could find it? Better yet, does anyone have one they'd like to sell? Thank you. I don't know the pattern name but it looks easy enough to draft up, then set the blocks on point. Very pretty but I don't know the pattern. You could try your hand at writing a pattern for it, it looks fairly simple. I don't know the pattern but it is very easy to figure out. Nice quilt. Good luck! I sure do not know, but is is very pretty! I kind of recall seeing that somewhere, and the smaller squares were charms. I think I figured that if the charms finished at 4.5" and there are two of them, that's 9", plus an inch for the white border, and that would be a 10" square. So the big square would be cut at 10.5 to finish at 10", and one inch sashing would be used all around. Have the young lady look through the Moda Bake Shop site. I tracked the quilt through Pinterest and lost it at Etsy, sorry. Maybe try a different angle - if she can't use this quilt to learn how to follow a pattern, maybe she can use it to learn how to dissect pictures of quilts to create her own pattern. Last edited by Peckish; 07-18-2013 at 07:58 AM. Here's a very similar pattern. Just have to do a few adjustments. it looks like 10 inch layer cakes and 5 inch charms put together with skinny sashings. great way to show off fabrics. I agree with Peckish that use this opportunity to teach how to plan your own quilt. I wish someone had taught me that early on in my journey. It is great of you to be passing on the knowledge and it is a very pretty and easy pattern. I agree with willferg, I think her proportions are correct. You need to know how large of a quilt that you want her to make. A lap quilt is best or smaller for a beginner. I would also suggest you do look at the Moda Bake shop. Lots of quilts that always inspire me. Thank all of you! I had to leave all day today and am just getting home. I will tell her about the dimensions/ideas y'all have and see what she thinks. She's made one baby quilt already, and I'm just so thrilled she has already went out and purchased more fabric! She had found the picture on my Pinterest account, but like Peckish said above... you lose it in Etsy! I'm going now to look at the link EazyPeezy gave me and at the Moda site. Whenever she gets it done, I'll try to post it for her! She's gotten some really cute fabrics! Thank all of you again! Ok, EasyPeezy, I'm back already! That pattern will work! She can visually look at it and change it to make what she is wanting. This will give her the basics of following a pattern from beginning to end. Thank you so much! She'll be excited too. PLUS, it was free! Can't get any better than that. I'm afraid I can't tell you the name, but it looks basically like a large square of fabric bordered in white lattice and 4-patch blocks bordered in lattice and set on point. It shouldn't be too hard to draft and if you don't want to figure the triangular setting triangles, I would just make the squares and trim them off (that's the lazy quilter in me speaking). It's a beautiful quilt, colorful and cheerful. 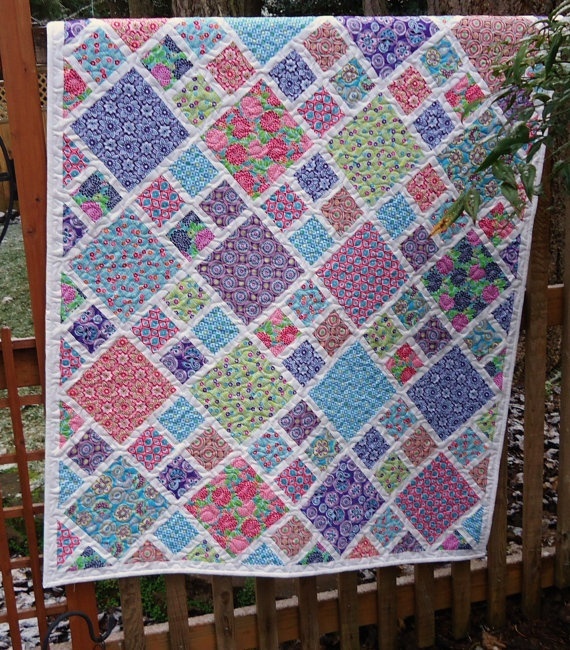 I did a similar quilt called "Baby Lattice". That pattern is on Moda Bakeshop but it is done using charm packs. I think that it could be adapted easily. 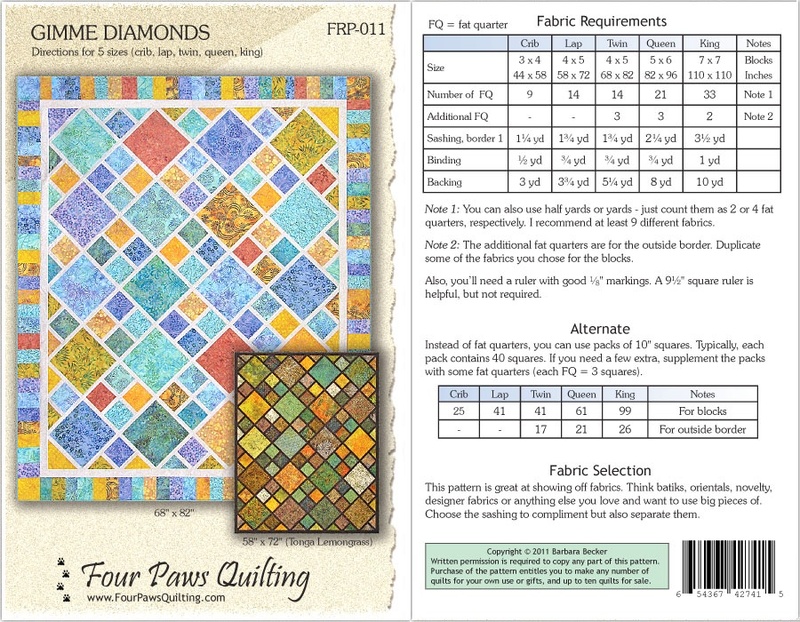 Diary of a Quilter also a layer cake friendly pattern for a lattice quilt. Hope this helps to get you started. Try modabakeshop.com. I think I saw something similar on that page. Very nice quilt! I have a layer cake and a matching set of charms. Looks like it will be perfect with 1" neutral strips in between and set on point. I wanted to use these fabrics without having to cut them and this will be ideal! Thanks for sharing the pic and inspiring me! Good luck working it out for yourself. Everyone's suggestions seemed on target here, so have fun! hopefully this allows the pic to show. Thank you so much Christy! This is IT! I'll let her decide if she wants to invest in the pattern, but since it has how much fabric is needed, I think we can wing it from here. Thank you so much for going to all this trouble!